Dry Erase Wheel of Fortune - 14 Multi-Colour Slots - Ships Same Day! This product is currently in production and is due to ship in 39 days. To place a back order, please complete the checkout process as normal. 3.18kg display sets up quick with no tools required! This dry erase wheel of fortune has multiple slots for writing in prizes, making it easy to customise the display for your use! 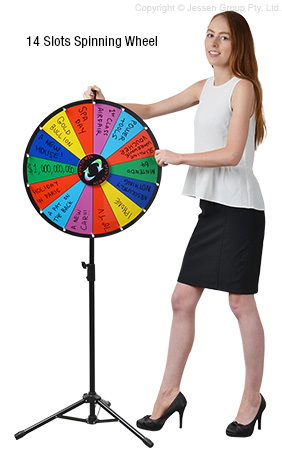 Like raffle drums and competition boxes, using a spinner wheel like this can help add excitement to events or parties at trade shows, schools, or within an office. The free standing wheel is height adjustable between 1150 and 1550mm, allowing any user to put it at the best height for easy spinning. A simple lever on the adjustable pole snaps into place to secure the pole and wheel at the desired height. The dry erase wheel of fortune, one of many fun ways to spice up an exhibition display, has multiple slots for writing in prizes specific for each event on the 600mm diameter wheel. There are multiple colours included that offer an eye-catching sight when spun, and each slot is 125 x 210 x 210mm to offer plenty of space for readable messaging. Each slot is also made of shiny acrylic to add to the overall professional appearance of this raffle wheel. Dry erase markers and an eraser are included with purchase to be ready to go out of the box, with wet erase markers also able to be used. The spinning wheel game is designed with portability in mind, with the entire display weighing 3.18kg and no tools required for fast set-up. A wing nut makes attaching the wheel to the pole fast, and the folding legs of the tripod are pushed into position and then secured using a thumb screw. Order today for fast same day shipping to anywhere in Australia when in stock with this and most other available products, only from Slimline Warehouse!